Bilbao’s Loiu Airport has modern terminal designed by Santiago Calatrave, built in the shape of a white dove, locals sometimes refer to the terminal as “La Paloma”. Located 9 km from the cityBilbao is a short 15-minute drive. To get into town, many taxis are available, a taxi to the city centre will cost around 25 EUR. Most airport taxis accept credit card, but be sure to ask beforehand. Alternatively, public transport options include a bus that leaves every 20-30 minutes from just outside the terminal to the right. Look for the green and white Bizkai Bus A3247 BILBAO-Airport. The bus makes a few stops in the city centre at 14 Alameda Rekalde, Plaza Moyúa and 74 Gran Vía before completing its journey at the Termibus bus station. Tickets cost is less than 2 EUR and can be purchased from the driver, local transit card or cash only. Bilbao's modern metro system, designed by Norman Foster features curved steel and glass entrances that seem to emerge from the ground. The metro system is simple and easy to use. 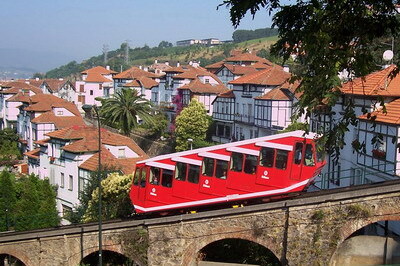 Two main metro lines run across the Old Town and out to the coastal towns of Getxo, Plentzia and Portugalete. If you want to visit Vizcaya Bridge, then take the metro to Areeta. Ticket prices vary according to zone, with single tickets ranging from EUR 1.50 to EUR 1.75. Day tickets are also available for EUR 4.60. If you are staying in the city longer and planning to take frequent public transport, you can purchase a local Barik transport card which works for Metro, Bus and Tram lines in the city of Bilbao and for Bizkai Bus and train provincial transport. Look for the machine that sells Barik cards in the main stations or ask at the Information booth. A new metro line to connect the airport is currently under construction. Bilbao was the first city in Spain to have an electric tram line. While the original tram no longer exists, today the sleek green Euskotren tram can be taken to cross the city. It runs from the Atxuri train station, next to the Ribera Market and follows the curve of the River Nervión, past the Guggenheim and San Mamés Stadium. In total there are 14 stops. Single tickets cost EUR 1.50 or you can also purchase a local Barik transit card at the Metro station. A relic of the past, built in 1915, Bilbao’s century old funicular connects central Bilbao to the Artxanda mountain. For views of the city and access to recreational green areas and parks, locals can leave the city behind in 3 minutes and enjoy a bit of nature. A favorite during sunny days, bring a picnic or visit one of the eateries at the top of the furnicular for a snack. 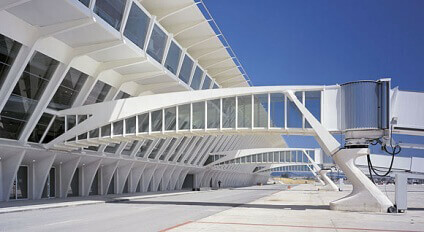 The station is located along Campo Volantin in the Castaños neighbourhood, close to the white Zubizuri Bridge. Services run every 15 minutes and costs EUR 0.95. You can also use a local Barik transit card if you have one. Bilbao taxi service is available 24 hours a day. You can call in advance or hail any cab with a green light on in the street. Taxi stops are also located around the city. Be sure to take only the first cab in line. Cabs are usually white with a red stripe on the door. Some drivers speak English, and if you're calling, companies tend to have translators for Russian, German and Chinese too. There are vehicles for people with reduced mobility, prams and other bulky objects if requested in advance. Inquire if they accept credit cards beforehand. Bilbao is a great city for walking thus it is not the most car-friendly. With many one-way streets and hills, parking on the street can be a challenge. Subterranean public parking lots are available if you choose to drive into the city. It is best to find a central spot to park and walk. Bilbao has an extensive public transit system that is safe and well used by locals. Waiting times are usually between 10 and 30 minutes. Inside the city the Red Bilbobus has 35 lines that cross the city. Single tickets cost EUR 1.25 or you can use the local Barik transit card. If you plan to explore the rest of the province, the green Bizkaibus can take you to other towns and cities of interest including Mundaka, Bakio and Gernika. Green buses pick up outside the Abando train station and at Plaza Moyua. Cost will vary dpending upon your stop, bring some euros or purchase a Barik transit card at the nearest metro station.